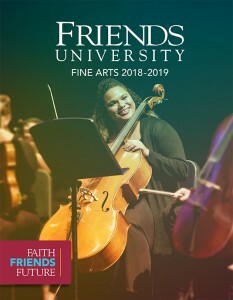 The Friends University Division of Fine Arts provides opportunities for you to create and perform in a challenging, but nurturing environment. We’re the region’s most exceptional Fine Arts program with skilled faculty who will guide and mentor you as you learn and grow as musicians, artists, dancers and actors. Click on the link below to see a complete listing of our Fine Arts events. Don’t miss these wonderful opportunities because they truly are treats for your eyes, ears and heart! For more information or to purchase tickets for any Friends University Fine Arts event, please call 316-295-5677 or 1-800-794-6945, ext. 5677. All sales are final. Tickets are non-refundable. 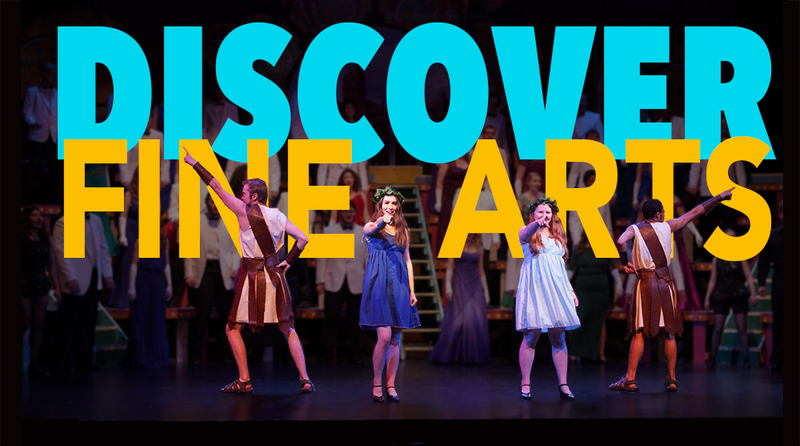 The fine arts department offers a great list of majors! To view these, visit the Fine Arts program pages. You’ll see we provide a showcase of artistic excellence, and we’re thrilled to have the opportunity to share the enthusiasm, energy and artistry with you! Known for our stirring performances at home and abroad, the sounds of the Friends University vocal and instrumental ensembles will not disappoint. Our ballet department has established itself as a regional leader and outstanding program of excellence. Sample a taste of their grand performances at the Fall or Spring Ballets, or at the annual production of “The Nutcracker.” Enjoy an assortment of our theatre productions that entertain audiences of all ages. Not a fan of music, ballet or theatre? Then stop by our art gallery to see a variety of artists who are sure to challenge you through their visual interpretations. Click on the link below to see a complete listing of our Fine Arts events. Don’t miss these wonderful opportunities because they truly are treats for the eyes, ears and heart! Currently, you can buy tickets for any of your favorite Fine Arts events. All sales are final. Tickets are non-refundable. The Fine Arts office is open 8 a.m.-noon and 1-5 p.m. Monday through Friday during most of the year. All tickets may be purchased at the office or by phone at 316-295-5677. If tickets are available, they may also be purchased at the door, which opens at least 40 minutes prior to each performance. Hurry up and order your tickets today because our events are sure to be popular! And don’t forget, we offer many free events that do not require tickets. For a detailed seating chart of Sebits Auditorium, please click on the link below. If you have additional questions or concerns, please contact us at 316-295-5677 or finearts@friends.edu. We would love to assist you! Join the Fine Arts mailing list by clicking the button below. Friends University, located in Wichita, Kan., is just north of Kellogg/US-54 between the Meridian Avenue and Seneca Street exits. From Seneca Street, head west on Maple Street. From Meridian Avenue, go east on Maple Street. once on Maple Street, turn south on Hiram Street. The Riney Fine Arts Center is the second building south of Maple Street on Hiram Street. For a detailed campus map, please click here. For a full list of Fine Arts events, view the 2018-2019 Fine Arts Brochure online or download the 2018-2019 Fine Arts brochure. If you have additional questions or concerns, please contact us at finearts@friends.edu or 316-295-5677. We would love to assist you!